If you’re looking for an app to save you time, StrongWeak is your new best friend. The StrongWeak standalone app provides an easy-to-read interface showing the strongest and weakest major currency movers. What used to require hours of chart analysis can now be easily and visually displayed in a matter of seconds, so you can make quick decisions on trading trends. StrongWeak aggregates movements (gains and losses) of a base currency against all other major currencies. (Ex: If EUR/USD rose 50 pips yesterday, then EUR reads +50 and USD reads -50). This is calculated across all major pairs. 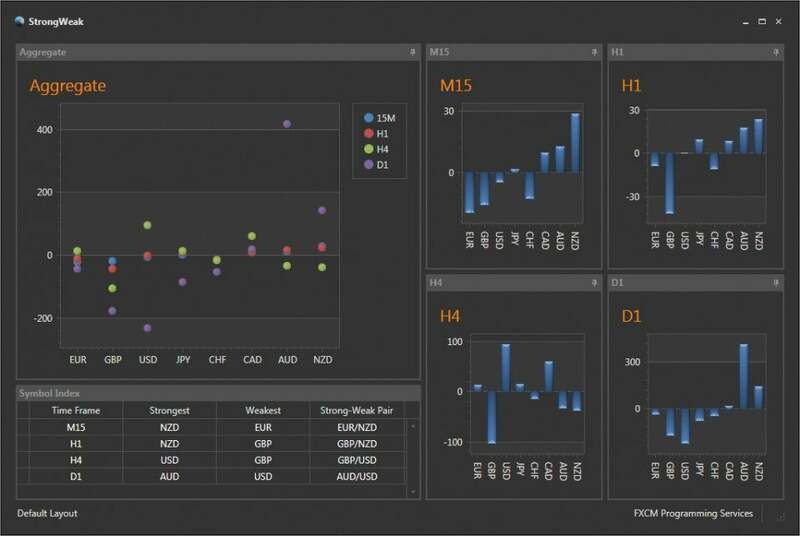 The app also shows the absolute strongest and weakest currencies for four timeframes (M15, H1, H4, D1) and shows the related currency pair.